Moving form chapbooks to a full-length collection of poetry can seem a daunting task. Least of all, there is the question of contents: producing a chapbook worth of poetry is one thing, but a full book? One way to approach the task is to re-use some material from earlier chapbooks. Bobbi Sinha-Morey has taken this route with her first full-length book, reprinting from her earlier e-chapbooks a number of the poems in Songs of a Sorceress. The problem with this is that is breaks the development of any real rhythym, and also that it throws too much emphasis upon words and phrases that cannot support them. It also has a tendency to mask patterns of sound in the lines, which would help unify the poems and make them more unified. and pieces such as "The Power of Benjamin Franklin" or "Atlantis 2000" are well worth the effort of hunting down Songs of a Sorceress for yourself. Although there are too many poems to mention all the highlights (such as "When the Moon Rains", or "Phantom Limb"), there are enough to make getting Songs of a Sorceress an important choice for any lover of speculative poetry. 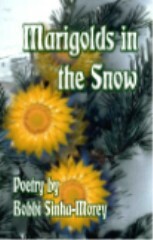 If you like or love poetry, get this book. You may find some of its contents disappointing, you may find it uneven, but, overall, what you will find yourself with is an excellent example of Sinha-Morey as a poet. 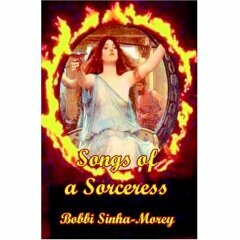 Songs of a Sorceress is well worth reading; Bobbi Sinha-Morey is a poet with a future. It would be good to see her develop a wider technique in her poetry, but she is certainly one of the more promising of young speculative poets.